Aren’t they cute? My friend Jacqui is a very talented illustrator who really doesn’t enjoy sewing, although I have been telling her for ages that I think her artwork would make wonderful embroidery patterns. 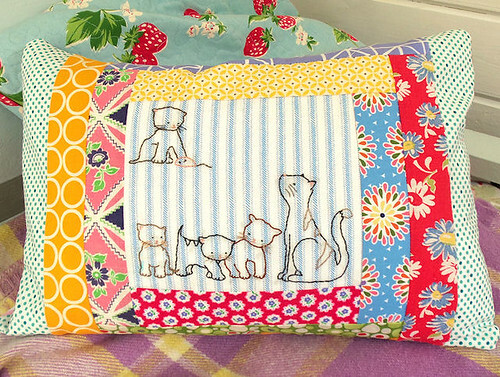 At last I have persuaded her to create a simply adorable design for us – I really enjoyed stitching it. The kittens and mother cat are in shades of brown with little pink noses and tiny green French knots for their eyes. 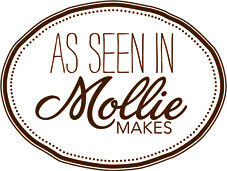 And if you’d like to stitch them for yourselves, then here’s the design …. Just click on the image above to view and download a larger version from Flickr. If you’d like more designs from Jacqui, then please could you leave a comment below to let us both know… we have plans for some more – but only if enough people like them!! 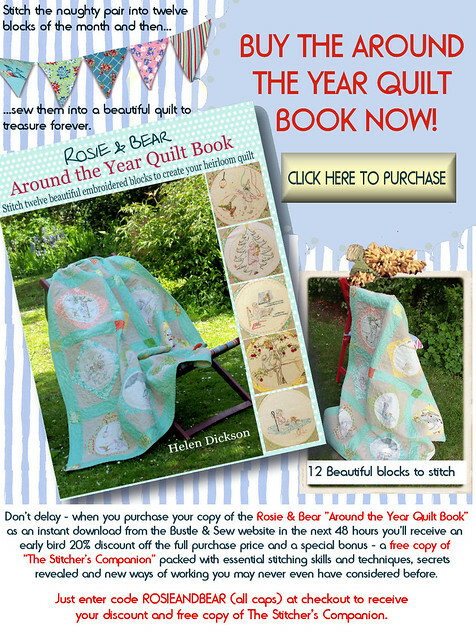 And finally …….. a special early bird offer if you purchase my Rosie & Bear “Around the Year Quilt Book” this week …. I love the kitties, any chance of puppy dogs? Oh definitely images such as these would be great embroidery patterns! The kitties are adorable! I’d love more, please and thank you! Those kitties are adorable! I’d love to see more of her designs. Love the kittens, so sweet! Thanks for sharing. Also, bought your book on Amazon as I wanted a hard copy and I love it! Can’t wait to get started! Adorbs! Now we need some puppies! And birdies! And…and… Thank you! Seriously! PLEASE, PRETTY PLEASE! The cats are adorable and I’d love to see more! Lindos!!!!! Posso usar para fazer um trabalho? These kittens are sweet! Yes, I would love to see more designs. I like dogs, cows…well just about any animal actually. Lovely work! Yes me tooo!! Would love more cute critters to stitch!!! Definitely yes, these are so cute. Thanks to you and your friend! I love this pattern and really hope you will make more! I will use these kitties to make something special for my little granddaughters who have kittens of their own. Thank you, Jacqui for sharing your adorable drawing. More, please! Too, too adorable – what a talented lady she is! Thank you so much! Yes, Yes, Yes! We would love to see more from this talented artist! Thank you for sharing the lovely embroidery pattern. The kittens are very cute. 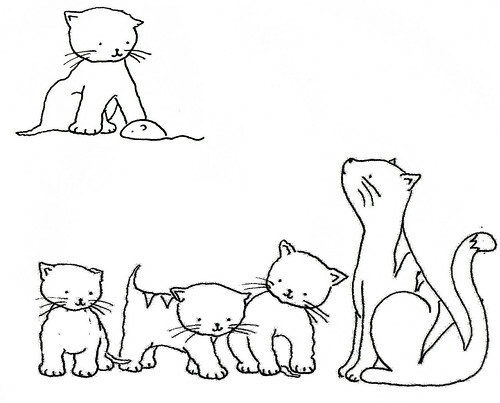 Thanks so much for the cute kitten pattern…the artist is so talented. Please thank her for us, and we’d love more! Thank you so so much for this adorable pattern. You’re quite right Jacqui is very talented. I love what you’ve done with the pattern. 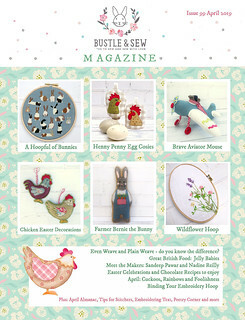 I to love these patterns, they make really good embroidery patterns. Tell your friend Jackie thanks. I love anything with kitties or bunnies. How about some sweet little baskets or maybe a Hot Air Balloon. Thanks very much for sharing this embroidery design. I tried drawing my own but they really stank! Too cute. I’m doing a red work quilt for my grand daughter. This will make a perfect block. Thank you both for sharing. Love this kitten pattern and would certainly enjoy seeing more from this designer! Lovely & Cute I like all animals. First I have seen of this design but they are darling! Are there more available?